Seattle area farmers markets: What’s new at yours? When it comes to the proliferation of neighborhood farmers markets, how many is too many? My friend and neighbor Rebekah Denn tackles that question and gets some answers this month in Seattle Magazine (read her story here). You probably know how I feel about farmers markets: I can’t get enough of them. Throughout the year I shop at Pike Place Market, the U-District and Ballard (among the year-round farmers markets). And I certainly appreciate the goods available further afield during farmers-market season (Columbia City? Worth the schlep on Wednesdays). You’ll find a wide-ranging list of local markets right here. But as much as I’m willing to drive far and wide to get my fill of those colorful venues, I get even greater joy knowing once spring’s in full-swing, there’s a Saturday market within walking distance of my front door in Edmonds. 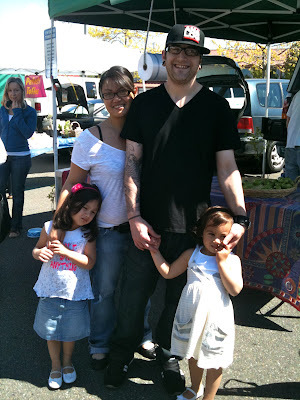 Chef Nate Crave (late of Spring Hill and Monsoon, now plying his trade at Etta’s), with his wife and daughters at the Edmonds farmers market on a recent Saturday. What ever your address, every year brings something new and exciting to the neighborhood farmers market-mix. 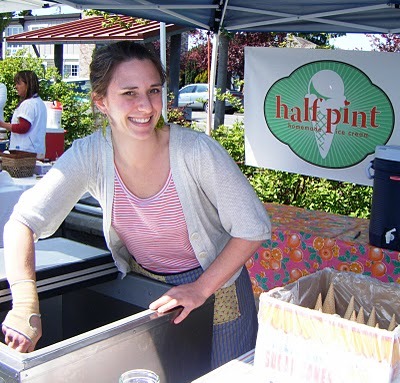 Last year in Edmonds it was Half Pint Homemade Ice Cream (perhaps you’ve seen owner Cle Franklin in your neighborhood, too). Cle Franklin, scooping ice cream in Edmonds last summer. Cle! Where are you? My half-pint is awaiting his Half Pint! This year, Edmonds snagged Pasteria Lucchese. Samuele and Sara Lucchese have been selling their pastas, sauces and desserts at the Ballard Sunday Farmers Market for five years, and this season, in addition to my hometown, you’ll also find them in Wallingford (Wednesdays), Madrona (Fridays) and the new Georgetown Farmers Market making it’s debut this Saturday, June 5. Samuele and Sara Lucchese, from Ballard-based Pasteria Lucchese. Their pastas sell out swiftly at “my” farmers market. I’ve made a point of treating myself to their handmade products now that they’re hanging in my ‘hood on Saturdays. So far I’m sampled chard pansotti (great side dish for roast chicken), lamb plin (next time I’m pairing it with tomato sauce) and carrot pappardelle (which tasted extra comforting today seeing as I’m feeling punk and in need of some “Jewish Penicillin”). Pasteria Lucchese’s carrot pappardelle “en brodo” (er, my homemade chicken broth). I feel better already. So, tell me about your neighborhood farmers market. What’s new this year? And in the event I’m in your neighborhood on a shopping expedition, which market stalls should I make certain not to miss?